Debora Greger and student interns create interactive activities and poetry-based educational materials for Harn events and exhibitions. 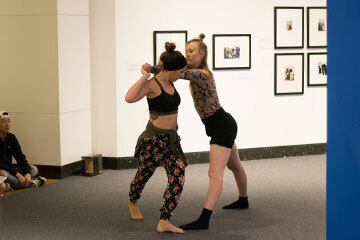 The Center for World Arts - Harn Museum of Art Choreographer-in-Residence, a student intern, develops short gallery dances for public performance in the museum during Family Days and Museum Nights and coordinates between the Harn and Swamp Dance Fest! The Harn’s cross-boundary Composer-in-Residence program is led by Ivy Chen. Through object study and independent research, Composers-in-Residence develop original works inspired by the Harn’s collection to bring art to life in new creative ways.